Watch a child sit patiently as an earth worm makes its way across the sidewalk. Observe them run outside to embrace the first snowfall. Witness as a pile of sticks and rocks becomes a sword, a letter, a house or a playground when placed in the hands of a child? These moments did not take place inside the 4 walls of a typical classroom setting; yet, there is educational value in those moments. At St. Albert Nature School, we believe that learning is most engaging and memorable when it takes place outside. 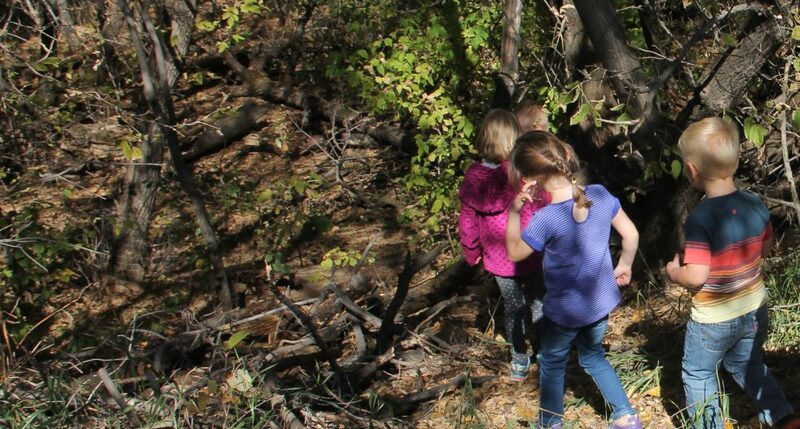 We offer programming for preschoolers (preschool program) and grade school classes (field trips) to engage in outdoor learning right here in St. Albert. If you see value in having children reconnect to nature; use these experiences to develop numeracy, science, social and literacy skills; while fostering a sense of community and connectedness to all living things, then our nature classroom is for you. Pretty, J., Angus, C., Bain, M., Barton, J., Gladwell, V., Hine, R., et al. (2009) .Nature, childhood, health and life pathways: University of Essex. Kuo, F. E. (2010). Parks and other green environments: essential components of a healthy human habitat: National Recreation and Park Association.